I wrote earlier in the season that J.T. 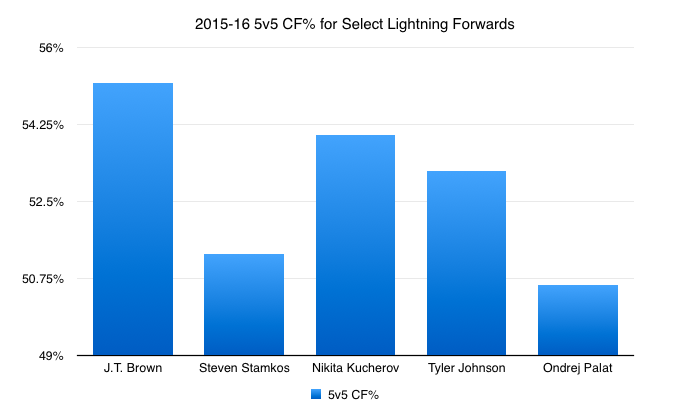 Brown had been really good for the Tampa Bay Lightning to that point. It’s time to check in on the speedy forward once again. The bottom line: He continues to give the Lightning really, really effective bottom-six minutes, and is quickly establishing himself as someone who should definitely be kept around moving forward. It might seem a little bit crazy to fawn over a third line guy like that, but the reality of the situation is that depth is important. Take a look at the Pittsburgh Penguins as a perfect example. A team can have all the star power in the world, but without a strong supporting cast it’s going nowhere. J.T. Brown is proving himself to be the definition of a strong supporting cast member this season. He may not be a superstar scorer like Steven Stamkos or Nikita Kucherov, but he’s incredibly effective at what he does. When he’s been on the ice this season, the puck has been moving in the right direction. When he’s been on the ice this season, the coach hasn’t had to worry. And, when he’s been on the ice this season, a little bit of offensive production has been sprinkled in. What more do you want out of a bottom-six forward? Again, no one is saying that your team should pick J.T. Brown over Steven Stamkos, but it’s hard to argue with the notion that Brown has been great for Tampa Bay. In my opinion the most important responsibility for a bottom-six forward is to NOT be a defensive liability. By driving play into the offensive zone better than almost every player on the Lightning roster, Brown is holding up his end of the bargain. Among NHL forwards who have played at least 300 minutes at five-on-five, Brown is ranked 40th in CF%. That’s… really good. Of course, the knock against Brown has never been that he doesn’t work hard enough, skate fast enough, or act feisty enough in his quest to move the puck forward. Rather, the knock has been that he’s got hands of stone. He struggles to put up points. He can get the puck into the offensive zone, but once there he can’t do anything with it. 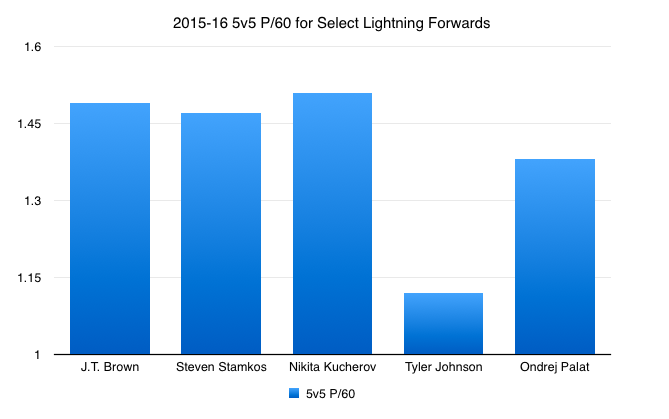 And, again, the point here isn’t to suggest that Brown is a bigger offensive threat than a Kucherov, or a Johnson, or a Stamkos. It’s to prove that he’s holding his own in the production department, especially for a bottom-six forward. Here’s the deal: Young players take time to develop. If this is Brown putting it all together, the Lightning should be very happy. He’s turned into a really effective NHL player in 2015-16. At the end of the day, signing free agents out of college is a bit like a lottery; it looks like the Lightning might have a winning ticket with J.T. Brown.